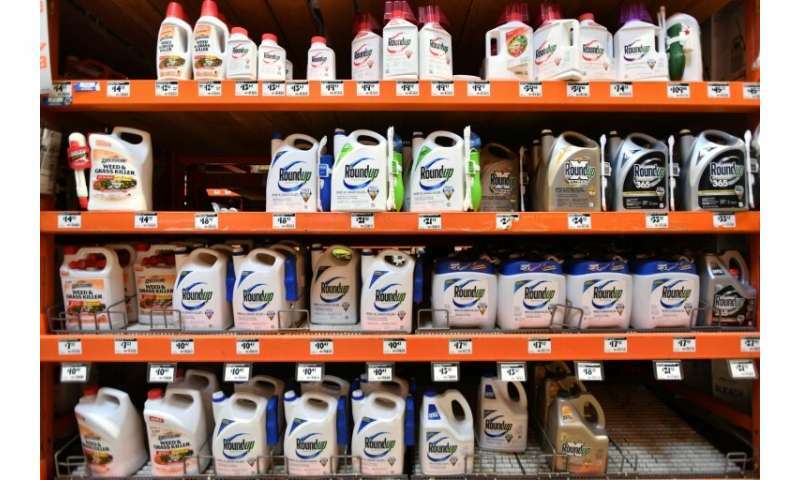 The controversial Roundup weed killer goes on trial again Monday in the United States, six months after a groundskeeper won the first-ever lawsuit accusing the chemical of causing cancer. 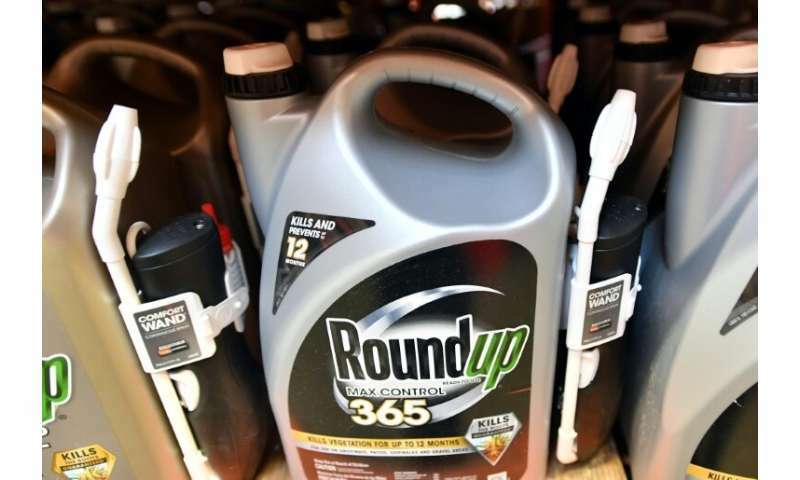 Roundup, a brand owned by German chemical and pharmaceutical giant Bayer after its purchase of US-based Monsanto last year, contains glyphosate that environmentalists and other critics have long maintained leads to cancer. Glyphosate is used in weed killers made by several companies, and is currently the most used herbicide around the world. Jurors in August unanimously found that Monsanto acted with "malice" and that its weed killers Roundup and Ranger Pro contributed "substantially" to Dewayne "Lee" Johnson's terminal illness. Now another Californian, Edwin Hardeman, accuses Roundup of contributing to his cancer, which is of the same type as Johnson's non-Hodgkin's lymphoma (NHL). Hardeman, of Sonoma County—north of San Francisco—says he used Roundup extensively to treat his property from the 1980s until 2012, according to his lawyers. He filed a complaint against Monsanto in early 2016, a year after being diagnosed with cancer. According to the complaint, the company "knew or had reason to know that Roundup was defective and unsafe" and that exposure to the product "could result in cancer and other severe illnesses and injuries." Information that Monsanto provided or communicated "failed to contain adequate warnings and precautions that would have enabled Mr Hardeman, and similarly situated individuals, to utilize the product safely and with adequate protection," Hardeman's lawyers added. Instead, the company "disseminated information that was inaccurate, false, and misleading," they alleged. Monsanto, which has sold Roundup worldwide for more than 40 years, is holding firm to its line of defense. The products are not dangerous if the conditions of use are followed, as proven by hundreds of scientific studies, it says. Like the Johnson trial, the new case will take place in San Francisco but it will be the first heard in a federal court, where some legal technicalities differ from the state level where Johnson won his case. Hardeman's is the leading case in a multi-district litigation of hundreds of similar cases which are legally linked, but will be heard separately. Although not a class action lawsuit, the outcome of the Hardeman case will provide a signal for the other jurisdictions. The Johnson precedent will also hang over the new trial which should last four or five weeks. Johnson was diagnosed in 2014 with NHL, a cancer that affects white blood cells. He said he repeatedly used Ranger Pro while working at a school in Benicia, California. Jurors in his case last August ordered Monsanto to pay $250 million in punitive damages along with compensatory damages and other costs, bringing the total award to nearly $290 million. Judge Suzanne Bolanos, who presided over the case in California State Court, later denied Monsanto's request for a new trial—but cut the damages to $78 million to comply with a law regarding how such awards must be calculated. The ruling sent Bayer shares tumbling on fears that a wave of costly litigation could be about to break on the firm. In November, Bayer said it would slash 12,000 jobs in a restructuring after the takeover of Monsanto, which asked a US appeals court to toss out the Johnson verdict. At Bayer's request, the Hardeman trial will be conducted in two stages. The first phase will seek to determine whether Roundup is responsible for the complainant's cancer. If the jury concludes that it is, the next step will be to decide whether or not Monsanto has a liability and, if so, what compensation should be paid. For the judge, the two-stage process aims to help the jury decide the possible liability of glyphosate without being influenced by the reputation of Monsanto, which has a controversial image all over the world, accused of having manipulated studies. Praised by farmers for its effectiveness and low cost, glyphosate is under particular scrutiny in Europe and especially in France, where authorities in January banned a form of the herbicide, Roundup Pro 360. But the chemical has been subject to contradictory decisions around the world. The European Union renewed its authorization of glyphosate for five years in November 2017, but President Emmanuel Macron has vowed to outlaw its use in France by 2021. A 2015 study by a World Health Organization agency concluded that glyphosate was "probably carcinogenic." 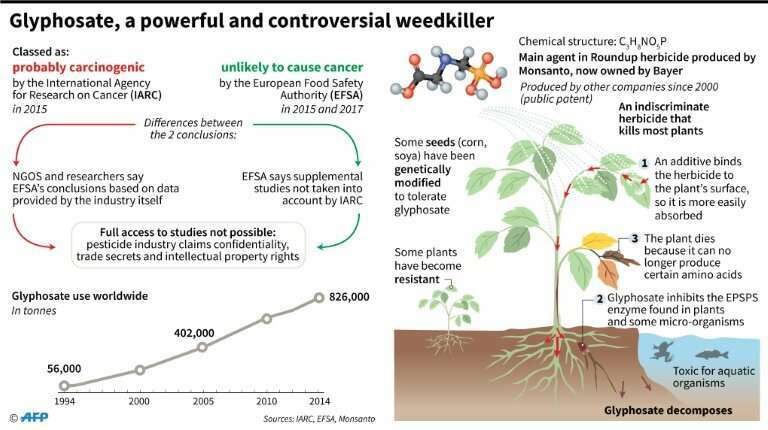 Environmental groups including Greenpeace have called for an outright ban in Europe for glyphosate but Monsanto insisted the herbicide meets EU licensing standards.